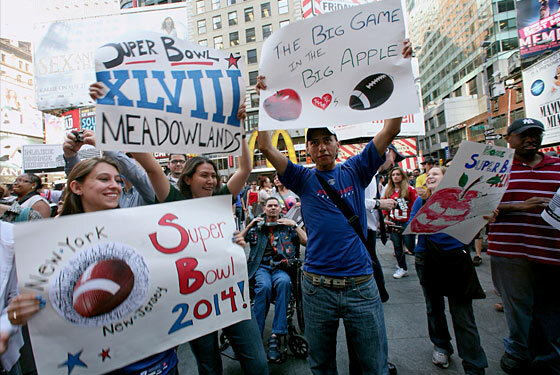 All the haters down in Florida couldn't stop the inevitable this week: The Meadowlands will host Super Bowl XLVIII in February 2014. Will it be cold? Sure. Will the players like it? Probably not. Does any of that matter? Nope, so let the fund-raising begin! But what happened this week that didn't involve predicting the weather for a day 44 months into the future? After winning the Subway Series, the Mets shut out the Phillies three straight times. Well done, Darryl. After losing the Subway Series, the Yankees took two of three against the Twins. Now prepare yourselves for the Hughes Rules. Eddie Curry had some money problems. Dwyane Wade said that the Free-Agent Four will meet this summer to discuss their options. We watched the underdog Beach Channel Dolphins win the city's high-school girls lacrosse title. And we previewed two more World Cup groups. That's it for us. We'll see you Tuesday.